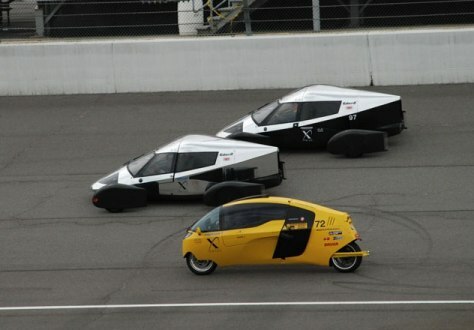 Two of Edison2's Very Light Cars (in silver and black) and one of the X-Tracer vehicles (in yellow) take to the track at the Michigan International Speedway during the finals of the Progressive Automotive Insurance X Prize. Edison2's Very Light Car No. 98, the car in the lead, won the top prize of $5 million, and the X-Tracer team won $2.5 million.